What do I do if the kiln doesn't heat at all (manual kilns)? Check many of the same things in the above section on Automatic kilns - power supply, branch fuses, short circuits, cord, etc. Make sure the infinitely variable zone input switches are turned on (if included on your kiln). There is a "click" in the "off position at "12 O'clock". Full on is the "click" position just to the right of this (1 O'clock). Infinitely Variable Zone Input Switches may have failed. Check to see if the Dawson plunger is not pushed into place. Power relays are one of the most important components in your kiln. They execute the will of the computer controller, giving power to the elements only when requested. These power relays are also mechanical switches which will wear out over time. Worn out relays can be the cause of slow or incomplete firings, error codes (E-1, E-d), etc. Other more obvious signs of relay failure are if a zone is lagging behind in temperature considerably or if you notice an entire ring of elements not heating/glowing. The surest way to test your relays is by using a multimeter to check input, output, and signal voltage. If you do not have access to a multimeter you can run a paper test, which will give you some indication of whether or not you have a relay out. One way to check the relays (or bad elements) is to check the temperatures of each zone by pressing "1", "2" and "3" in sequence and recording the temperatures of each thermocouple at intervals over the length of the firing. If one zone is consistently firing at a lower temperature then you probably have either burned out elements or a bad relay. If the relay does not make a soft clicking noise when the kiln is turned on try turning the kiln off and on and then restarting the program. Set your multi-meter the approximately 24 volts AC. Check the voltage coming into the coil of the Power Relay. You can tell which wires these are because they will be the small wires coming from the control. 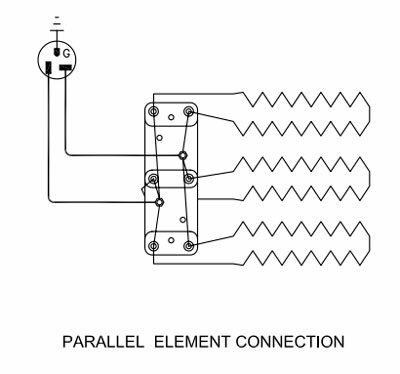 This test will tell you if you are getting power to the relay coil which actuates the relay. Unless the relay is actuated by the control you will get no output from the power side of the relay. With panel plugged in and firing check output from Power Relay with your digital multi-meter. The meter should be set to the next highest voltage above 240 volts AC. Output should be approximately the rated voltage of the kiln when it is supposed to be calling for power to the elements. CAUTION: LIVE ELECTRICITY IS INVOLVED WITH SOME OF THESE TESTS. This test should only be done by an experienced person familiar with electricity. Unplug kiln or turn off circuit breaker if the kiln is wired direct to your power supply. If you can not physically be sure the power is disconnected (for instance is you see that the cord is unplugged you KNOW there is no power coming into the kiln) then check the voltage at the power connection pluck with your multi-meter. Open up the control panel. This will be a little different on each kiln series. 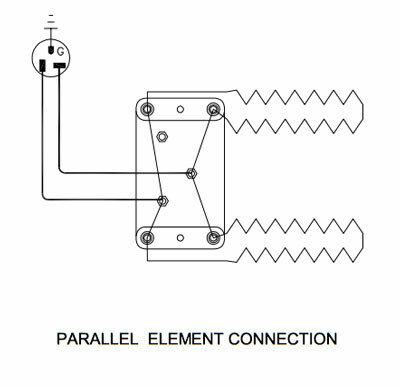 Remove or open the panels that cover the element connections. Check the tightness of all connections. Do this by wiggling the connector to make sure nothing is loose. Make sure all wires are connected to their proper connection point. You may have to compare the kiln to the wiring diagram to be sure of this. 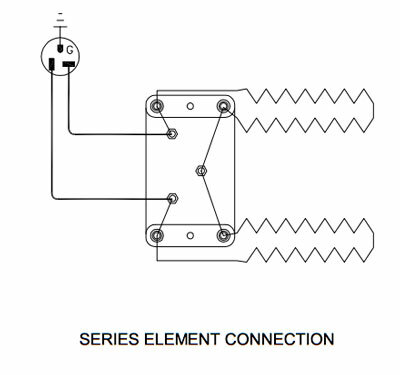 This step would be particularly important if a wire has come loose. Specifically look at wires going from power connection block to the on/off switch, then to the control fuse, and finally to the control transformer. Make sure all wires inside control panel are connected. Look for any burned spots or deteriorating wire. Look for any short circuits. 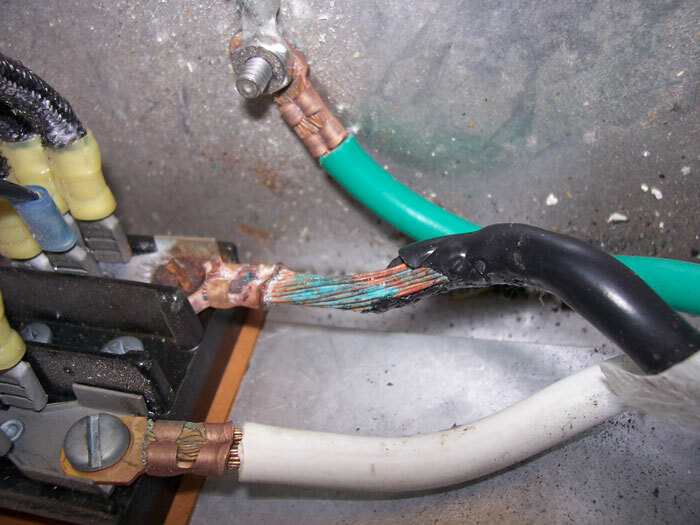 This might be caused by a wire losing its insulation and touching another component for instance. Typically if there are any short circuits there will be some evidence of a burn on the metal the wire touched. Look for dirt or foreign material. Some material can be an electrical conductor and could cause a short circuit. Clean out any dirt. Pull off and reseat all spade connector connections of power wires to remove oxides and ensure good connection. CAUTION: Turn power off to kiln from the circuit breaker or unplug the kiln. The control fuse is normally located on the side of the control box. Twist open the fuse holder and physically check the little fuse. If the fuse is blown then you will see the metal element inside is melted. Optionally, you can use your digital multi-meter to check continuity across the fuse. Make sure the circuit breaker or fused disconnect switch is turned on. If you have a circuit breaker flip it back and forth to make sure that it is really on. Some circuit breakers, if they have tripped, will not be obviously in a tripped position. By flipping it back and forth you will reset the circuit breaker. Check fuses for voltage continuity. You can do this with your multi-meter. Make sure fuses or circuit breaker are/is the proper amperage and type. 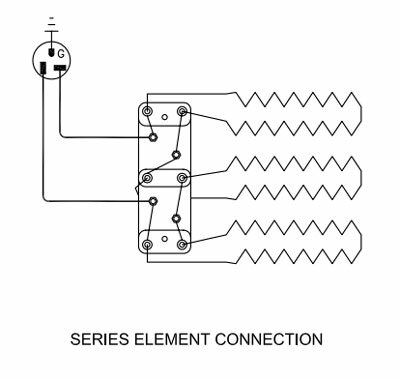 See your wiring diagram for the required fuse type. CAUTION: This test should only be done by an experienced person familiar with electricity. 1. Check for voltage (12 volts DC) between the output contacts (AC1 & AC2 marked on the control board) ground (any green wire). Remove the control box and the insulation panel. Remove the wires to the relay. Remove the nuts from the studs that hold the relay in place. Remove old relay and replace with new one. Visually inspect the wire connectors. Do they look corroded or "cooked"? Are the wires frayed? Any corrosion on the wire itself? If any of this is questionable you should replace the appropriate wires. Reconnect all wires. Visually inspect to make sure the spade connectors are down as far as they can go and feel to see that they are tight (a gentle tug should not remove one). If they are loose for some reason remove the wire and slightly squeeze the spade connector with pliers to tighten it. IMPORTANT: The slip on wire connectors cannot be loose or corroded. If there is a bad connection then heat will be generated and the component that they slip onto (relay, terminal strip, etc) may overheat and fail. If you squeeze the slip on terminal to make it tighter–be sure to squeeze it evenly so that one side is not tight and the other loose. If there are any doubts about the integrity of the wire or the connector replace the whole wire or harness. Similar in any L&L automatic kiln. Follow proper electrical safety practices. See this page for the 12 Volt 30 Amp relay we use for most kilns. See this page for the 240 Volt 30 Amp relay we use as a control relay for 480 volt kilns. See this page for all contactors and relays. Be sure to keep the wires on in the right sequence when changing a power or control relay in an Easy-Fire, Easy-Fire XT, School-Master or eQuad-Pro Kiln. The configuration is similar in a Jupiter panel or as control relay in a DaVinci, Hercules, or Easy-Load panel. Make sure kiln is unplugged or locked out and tagged out at the circuit breaker or fused disconnect switch when doing this maintenance.